The ideal study aid for all those learning about human anatomy. 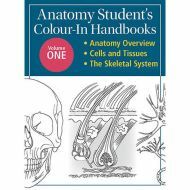 This comprehensive new title is the ideal study aid for all those learning about human anatomy, from medical and nursing students to healthcare trainees. Designed to be easy to use, each double- page spread tackles a given anatomical element. Detailed, full-color illustrations with numbered elements are on the right hand page of each spread, while the left hand page has corresponding numbered labels and concise anatomical notes. Readers can use the book both to learn the names, locations and functions of all of the anatomical components of the body, and to test their knowledge with the color-and-label revision section that concludes the book.This combines two proven study tools; by coloring the anatomically correct illustrations, you will increase your understanding of the relationships between body parts, and by testing yourself on the names of each part (with answers at the bottom of each page) you improve your memory and recall of anatomical names and locations.